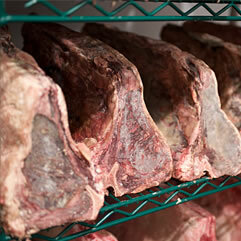 Dry aging beef has always been a ‘niche’ process, though the process of aging beef has changed over time. Years ago, beef processing plants would only sell whole beef, either in halves or quarters, and then transported these to the butcher shops stacked like cordwood in a truck. If you have any old butcher shops in your neighborhood, you might have noticed that at the receiving door there is a rail extending outside the building. This was to facilitate putting the beef quarters on wheels that could then roll right into the shop. Now if you were one of those butchers who dry aged, receiving whole beef was exactly what you wanted. The dry aging process is a destructive one; parts of the meat that are exposed to the open air must be trimmed once the dry aging is complete. Because of this, the most ideal condition for dry aging beef is to receive the beef in quarters. You’ve got the bones acting as a protection on one side, and a thick layer of fat on the other side. Sometimes in the late 80s, however, there was a major sea change in the business with how the beef was processed and packaged. During that time, slaughterhouses were starting to coalesce, and small independent slaughterhouses were closing. In our case, it went from 5 or 6 small slaughterhouses in northern CA to maybe just one, and the rest were large operations out in the Midwest. With the shift in where the cattle were slaughtered came increased shipping costs. Stacking the beef quarters in a truck didn’t make sense if you were going cross country – there’s simply too much wasted space. Combined with the newer technology of vacuum sealing machinery, it became more advantageous to process the beef into what are called “primals” or “sub primals” – major muscle groups that could be separated out and fit into smaller boxes, which in turn could stack neatly in a truck for transport. Now, instead of receiving a whole steer in 4 pieces, butchers were receiving 6 or 8 boxes containing these primals. The ribs would be in one box, the shortloin in a separate box, the round in another, and on down the line. As this method of packaging and transporting beef caught on, slaughterhouse realized they were able to sell different configurations of these boxes – they were no longer having to sell beef as a whole unit. If a customer wanted to purchase only the prime ribs, for example, it was possible to do so. This is pretty much where the industry is today. What makes dry aged beef different, and how is it done? Let’s start with what sets dry aged beef apart from unaged beef. 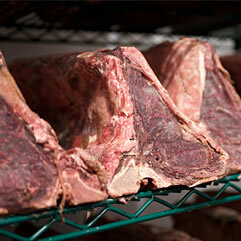 There are two major elements that are affected in dry aging beef – the tenderness and the flavor. 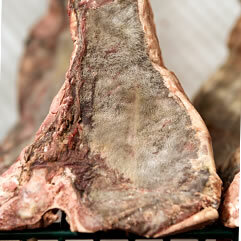 If you look at dry aging from a scientific perspective, you can think of it as a controlled decay process. When done in a monitored environment, introducing the beef primals to the air allows the occurrence of natural enzymes that slowly begin to break down the molecular bonds of the meat. As these bonds are slowly broken, the resulting steak becomes more tender. Now, the next question you’re probably asking yourself is ‘So the longer dry aged the better?’ Not necessarily. In a properly controlled dry aging environment, you could in fact take a primal out 100, 150, even 200 days. However, the noticeable tenderness of the dry aged steak at 200 days will not be tremendously different than that same steak dry aged 100 days, or even 45 days. What is going to be a hugely different is the flavor. Though a long winded analogy, the concept is the same for dry aged beef. Except instead of putting that pot of stock over a low flame and waiting 24hours, beef primals are exposed to the open air in a controlled aging environment and left for anywhere from 7 to 60 days (or longer, depending how crazy you are). By ensuring the primals are open to the air on all sides, it allows the moisture within the meat to slowly evaporate over time. Depending on how short or long the aging process is, you will have relatively tame to overwhelmingly intense flavor profiles. You will also see a surprising amount of weight lost, proof that moisture from the beef is evaporating. Interestingly enough, this moisture loss occurs at the fastest rate during the first two weeks of dry aging beef, then it will slowly decrease. Going back to the question of if quality can be determined by length of dry aging alone, while a steak with anywhere above 14 days of dry age will surpass those without any age, once you get into the longer aging periods, say a 75-day, the flavor profile of that steak is much stronger than the majority of people enjoy. Both of these elements, the tenderness and the flavor, that are brought about by the dry aging process, cannot be truly replicated. Rushing or cutting corners isn’t an option, true dry aged beef is a luxury that can turn an ordinary dinner into something remarkable. 1. Wet Aging. A couple of ribs (primals) in the original packaging; this is exactly how they arrive to us. This is an image of what Wet Aging is, simply keeping the product in the cryovac packages. 2. Dry Aged: these are shortloins that been been exposed to the air for about 3 weeks; it’s at about this stage that mold begins to develop on the outer surfaces. This is why there is so much waste with Dry Aging; so much of the outer surfaces must be removed to get the final product. 3. 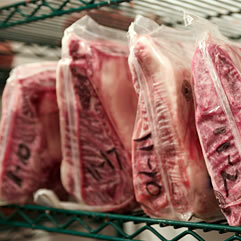 Dry Aged: same type of primal as #2, but with only 2 weeks of age. 4. A true 40 Day Dry Aged Striploin.